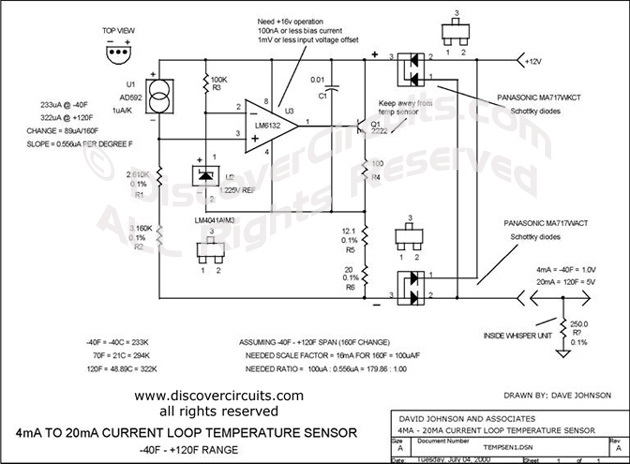 Circuit: TEMPERATURE SENSOR WITH 4 TO 20mA CURRENT LOOP __ Circuit designed by David A. Johnson, P.E. I designed a circuit similar to this one years ago to accurately measure the air temperature inside a building 1000s of feet from a control room. The circuit uses a very robust current loop method. It uses a highly accurate semiconductor temperature sensor and an equally accurate voltage reference. The circuit includes a diode bridge, so it is polarity independent. By using the component values indicated, the circuit should not require calibration. It has a range from –40F to +120F and an accuracy of +/- one degree F.